Artist's concept illustrating a quasar. The significance of a discovery made by two teams of scientists, can be surmised from the straightforward statement put forth by NASA – “…the largest and farthest reservoir of water ever detected in the universe.” Simply put, this is by far the greatest volume of water ever identified by humankind, and it exists in space surrounding a supermassive black hole (or a quasar). To put things into perspective, the water volume in this ‘reservoir’ accounts for a whopping 140 trillion times all the water present in our Earth! And the really interesting part is – this humongous water body is more than 12 billion light-years away from our native world. Now, we should understand that given the dynamics of time and space, the image of any far-off object seen through telescopic lenses literally gives us a view into the past. For example, the Pillars of Creation, while being visible to us, was probably destroyed 6,000 years ago. But since light only travels at a finite speed, the light of this destruction will only reach Earth in around the next 1,000 years. Likewise, in the case of this gargantuan water reservoir in space, the events that have been detected already happened 12 billion years ago – thus making the universe ‘only’ 1.6 billion years old during the scenario. In essence, it proves that water did exist even when our universe was relatively young. Water vapor is an important trace gas that reveals the nature of the quasar. 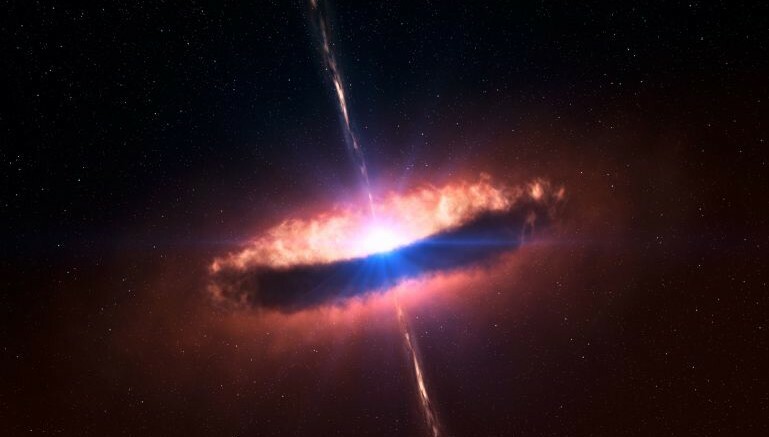 In this particular quasar, the water vapor is distributed around the black hole in a gaseous region spanning hundreds of light-years in size (a light-year is about six trillion miles). Its presence indicates that the quasar is bathing the gas in X-rays and infrared radiation, and that the gas is unusually warm and dense by astronomical standards. Although the gas is at a chilly minus 63 degrees Fahrenheit (minus 53 degrees Celsius) and is 300 trillion times less dense than Earth’s atmosphere, it’s still five times hotter and 10 to 100 times denser than what’s typical in galaxies like the Milky Way. When translated to manageable figures, the total volume of water vapor present in our Milky Way is 4,000 times less than found in the quasar. 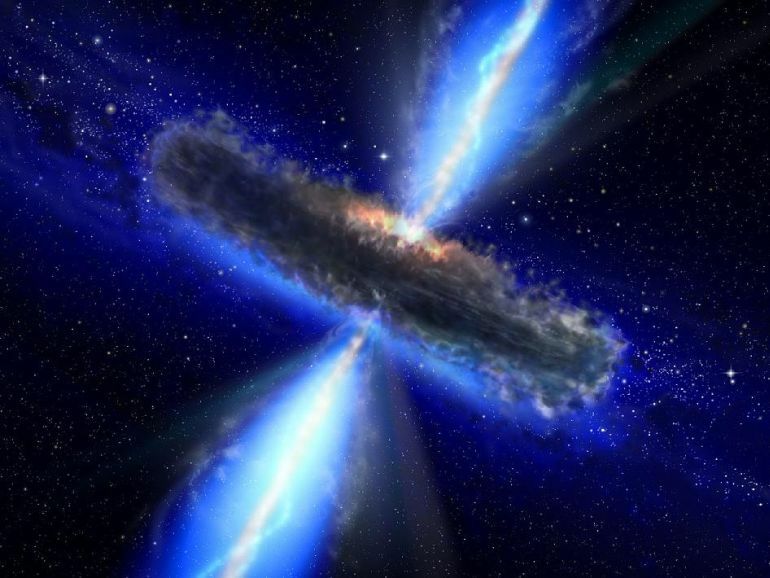 In fact, the quasar has access to so much water vapor and carbon monoxide that it can feed on these proximate gases and grow to about six-times its initial size. Now of course, there is no way of ascertaining this outcome, given the possibility of some volumes of gases being ‘condensed’ into stars, and other being simply ejected from the massive object. Now as for the crux of the scenario, this incredible discovery alludes to how water has its primeval origins since the beginning of the universe. More importantly, water is a crucial component when it comes to human habitation and expansion. So, if we are to become the space-faring species, it will be our water-harvesting skills that would potentially decide and direct our planet-trotting (and inhabiting) endeavors of the future. Another artist’s concept illustrating a quasar.